Wow, making a lunch run to Walgreens was a lot more dangerous than I imagined, and I'm not talking about the "foolish person" who stopped in the entrance to decide which side of the parking lot to park in. 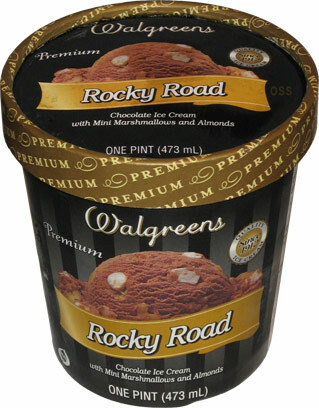 No no, I mean it's dangerous to be alone with a melting pint of tasty Walgreens Rocky Road ice cream in your car. Early this morning, I already knew I wanted ice cream, so I had my lunch around 11 so I could do an ice cream run later. I was tempted to give Meola's one more shot, but decided to make the 3 minute trip to Walgreens instead. I picked up Rocky Road and Waffle Cone, and after a quick debate, I cracked open the Rocky Road.